Are you having a reception or engagement party at Highclere castle? Want the best wedding photographer to capture your day? Highclere Castle is a simply splendid place to hold a wedding reception or party. Commonly known as the place where ITV’s Downton Abbey is filmed, the castle is a unique and highly historic place for any couple to celebrate their nuptials. You may also recognise it from Fry and Laurie’s 1990s comedy series ‘Jeeves and Wooster’. A country house built in the Jacobethan style, the castle also has a vast, 5000 acre park designed by Capability Brown. Found 5 miles away from the town of Newbury, Highclere castle stands on the site on a former medieval palace of the Bishops of Winchester, who used to own the estate in the 8th century. In the 19th century this beautiful house was remodelled and largely rebuilt for the third Earl. For a great wedding photographer to documents your nuptials at Highclere, simply head to Iain Gomes. Specialising in both commercial and private commissions throughout the UK (and beyond), Iain has a unique and beguiling style that produces images all members of your wedding party will love. His passion is to combine story-telling with producing photographs as unique works of art. 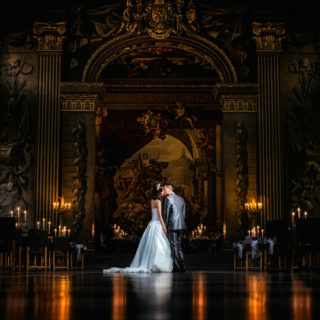 Iain has previously worked at such stellar venues as Berkley Castle, Leeds Castle, Eltham Palace, St Paul’s Cathedral and The Sydney Opera House in Australia. For examples of his work, take a look here.